Snow in South Africa isn’t rare, just ask those near the Drakensberg mountain range. But for the internet this weekend, seeing a giraffe in the middle of snow-covered vegetation was just a little too much to handle. On Saturday a post of this very scene on Reddit’s r/NatureIsFuckingLit received more than 31 000 positive karma, with more than 400 comments to boot. The cold giraffe was snapped by local Instagram user Kitty Viljoen, whose timeline is packed with other remarkable snaps of the frigid Eastern Cape landscape. 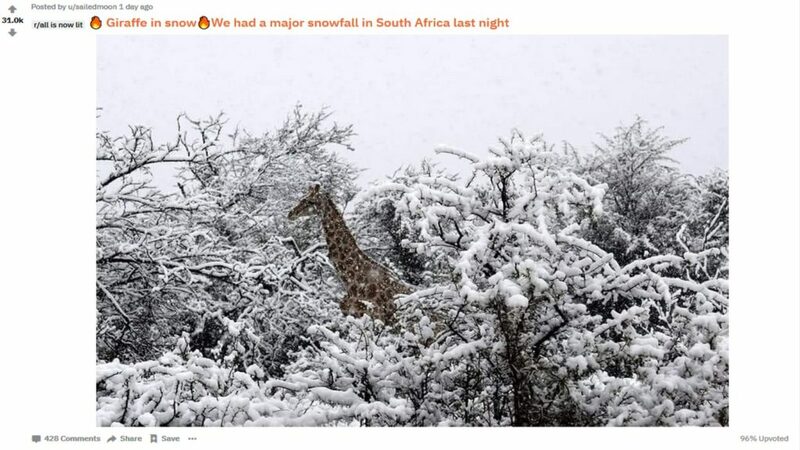 Users on the subreddit were genuinely curious about South Africa’s weather, querying how often snow falls in the country. “Didn’t know that could happen,” wrote one Redditor. Snow falls were experienced across the high-lying areas of the Western Cape, Eastern Cape and southern areas of the Northern Cape, largely thanks to a passing cold front.